For spreading or removing tile grout. Used to wipe excess grout from joints. Corners rounded to prevent digging or marring joints. Natural and synthetic fibers set in platic block; designed to ease work when scrubbing tile and grout lines, floors, baseboards, walls and countertops. Economy grade Ergonomic handle. Grouting floats for job specific applications. Highly absorbent and chemical resistant; "skin" increases durability and strength; ideal for wallpapering, general cleaning, grout and masonry work. Removes old grout for repairs. Tungsten carbide grit edge cutting blade. Toothed steel blade to remove debris. Bright metal finish is corrosion resistant. Non slip angled handle for ease of use. Blades fit into tight grooves. Carbide cutting wheel; long lasting, scores tile for a clean break. Carbide cutting wheel. Pro style scoring wheel Easy-to-install factory wheel replacement. Long lasting precision bevel for cleaner cuts. Titanium coated carbide cutting wheel. Made from seamless white plastic. Blue molded-in tip can be cut to desired opening. Used for holding and dispensing grout or mortar. Easy cleanup. 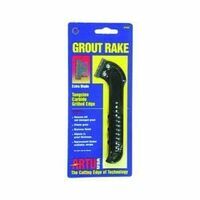 Tile grout saw for removing tile grout. Angled carbide blade with comfort handle. For fast, accurate tile installation and alignment with professional results. Use for even grout lines and tile spacing. Polypropylene. Extra-tough nylon backed with PVC. Specially designed for continuous use. Provides the extra reach needed to transport panels with better balance, control, and visibility. Angled 14" handle keeps hands away from panel for comfort. Do Not Exceed 200 lbs. carrying weight. Drop forged steel body with tungsten carbide faced jaws. Orange spring back handles. For fast, accurate tile installation and alignment with professional results. Use for even grout lines and tile spacing. Polypropylene. Tile Pliers/ Hand Cutter are designed with the same purpose as tile cutters. Cuts, scores and snaps wall tile and thin floor tile up to 1/2". Drop Forge handles. Includes: Tungsten Carbide Wheel. Cutting tools for use when making irregular cuts or holes in tile or backerboard. Applications: Cutting Curves in Tile, Stone, & Marble. Gum rubber float bed with Thermo Plastic Resin handles. Grouting floats for job specific applications. Thermo Plastic Resin handles. Grouting floats for job specific applications. Backerboard Scoring Knife is used to score cement based backerboard. Knife scores the backerboard sheets making the backerboard easy to bend and snap. Reversible blade creates additional cutting tip. Includes: Scoring Blade in Handle. Aluminum backing plate is permanently bonded to the non-porous 1/4" black neoprene pad. Comfortable handle. Applications: Brown Coat, Quartz or Marble Finishes. Pure gum rubber face is bonded to the dense rubber pad, and then cemented to an aluminum backing plate with a smooth handle. Edges are beveled and the two front corners are rounded for ease of spreading. Dense rubber pad is designed specifically for tile grouting. Raises drywall 3" from floor and holds board flush against wall when securing. Roll wheel on bottom of lifter for moving ease. Tile nippers for irregular cuts on tile or stone. Long lasting tungsten tips. Comfort grips reduce fatigue. Removes damaged grout from between tiles. Double blade design; carbide grit blade cuts grout quickly, toothed blade clears cutting debris. Offset blade mount keeps knuckles away from work. High impact plastic handle. Pure gum rubber face is bonded to dense rubber pad and then cemented to aluminum plate with a smooth handle. Edges are beveled and the two front corners are rounded. Dense rubber pad is designed specifically for tile grouting. Grouting tool for spreading tile grout. For M-D Building Products heavy duty tile grout saw. Designed with long-lasting diamond cutting blades. Fits: sku# 294.1144 Wide bit for shaping tile. Cut tile up to 1/2 inch thick. Carbide cutting edges. Balanced forged steel construction. 5/8 inch wide offset jaws open with return spring. Tile nippers for irregular cuts on tile or stone. Twice the power of conventional nippers. TPR ergonomic comfort grips. Replacement Blade for sku# 162.3651 Diamond coated rod saw blade is used for cutting curves in tile, stone, and marble. Replacement blades for 19402 (691.4402). Contains: (1) One Carbide Grit Blade. (1) One Toothed Blade. Machined aluminum cutter head. 7/8" titanium coated tungsten carbide cutting wheel. Nylon bushing for trouble free operation. Vinyl base trim for improved grip on smooth surfaces. Heavy duty steel base with silver enamel finished base and steel handle. Cutting capacity 12'' square by 3.8'' thick. Replaceable hardened tungsten carbide cutting wheel. Clean-up of grout haze and hardened grout. Made of synthetic materials. Sturdy reusable bucket; essential items needed to install ceramic floor tile; includes trowel, tile nippers, grout float, sponge, gloves, tile spacers and 2.5 gallon bucket. For easy application of grout between tiles on detailed installations. Silicone lined, long-lasting reinforced tip. Clean-up of grout haze and hardened grout. Machined aluminum cutter head. 7/8" titanium coated tungsten carbide cutting wheel. Nylon bushing for trouble free operation. Vinyl base trim for improved grip on smooth surfaces. Heavy duty extruded aluminum base will not break, crack or chip. Ball bearing carriage-smooth trouble-free operation. Chromed steel rails. Heavy duty aluminum base will not break, crack or chip. Ball bearing trouble-free operation. Machined aluminum cutting head. Extends to 11 ft., 150 lbs. capacity, steel construction. Can be used for walls as well as ceilings. Mounted on three 5 in double lock heavy-duty swivel casters. Made for professional and do-it-yourself jobs. Design for indoor use.